It wasn’t long before I got bored with my surrounding area. I found a few small cave systems, and managed to get some coal and iron out of those (iron makes for pretty good tools), but that’s it, really. I contemplated traveling a long way in one direction, setting up a temporary base camp when it would get dark, and continue the next day, but I figured that wasn’t the smartest thing to do in my current situation. I went to the beach one day, and saw some squids. I followed them, and was quickly blown off-trail. I had a really hard time finding my way back home, especially when it was already getting dark. In the end, I managed perfectly fine, but it showed me the danger of straying too far away from home. So, what did I do to spend my time? That’s right, a made a mine. Who knows, there may be very valuables things buried in the ground! If I found, say, gold, I could bribe my way in if I ever found a civilisation. More coal is a good thing, too. Keeps the fire lit at night. I thought up some ideas, drew them onto the ground outside (sadly they were washed away by a rainstorm a few days later), and decided on what I was going to make. A cylindrical mineshaft. That sounds pretty cool. But how am I going to pull this off? 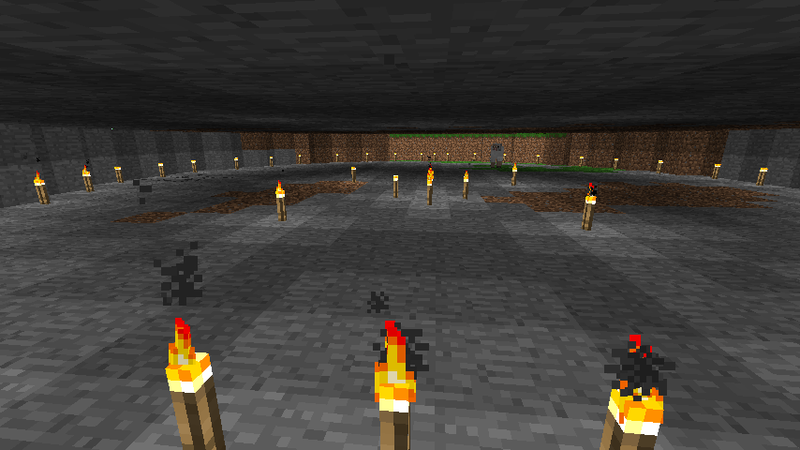 I started by digging out a circle underground. Twenty-five metres in diameter, to be precise. It does look rather dark, though. Can’t I build a glass half-sphere on top of it? Its been a while since I’ve play minecraft, but can’t you make a map in case you get lost? Man that must have taken you all day! I never did very well with Minecraft, but I have played a bit of a game called Ace of Spades. It’s like a team shooter version of Minecraft, and it’s pretty fun! Sounds cool.. I’ve never played this game. Hmm… Maybe I should check it out, eh? If you manage to turn this into a mineshaft, than you have more patience than I ever did. i’d never played it. but it must be great because everybody is playing it! Sounds like a cool minecraft day. That is something I should do on my game. My personal mine is really messed up, but I do now have a personal base of operations. Sadly it isn’t the hundred meter high tower of death I imagined it to be. I also can’t find any iron :( Which is the main reason my mine is so messed up. I do wish our plucky little adventure luck in staying alive though.